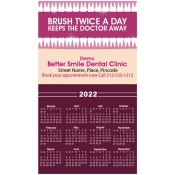 Dental calendar magnets make value effective promotional tool for dentists and orthodontists because they offer a year round visibility in a one-time investment. 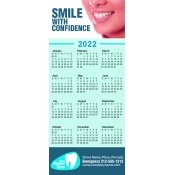 Dentists and orthodontists can improve their visibility by giving these promotional magnets to their clients during consultations and services. 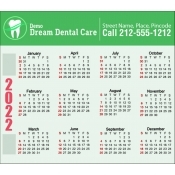 We offer these dental magnetic calendars in different shapes, sizes and styles to meet the growing requirements. Free shipping is offered. Huge discounts are offered for wholesale orders on these customized calendar magnets. Over the years, dental services have relied on customized pens, sticky note pads, letter openers, dental floss and many other promotional items to improve their customer relations. No doubt, these advertising specialties have helped them to strike a chord with their customers in a positive way. However, most of these promotional items have become redundant due to their limited shelf life. Calendar is the only gift which ensures long visibility against many other low budget items. People hang these calendars in their drawing rooms, kitchens, or office cabins and think highly of the businesses which gifted them those. 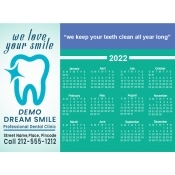 Promotional dental refrigerator calendar magnets are enriched version of calendars which used to hog limelight at various places around the home. Now people can closely look at them over the refrigerator doors. In addition, they will be happier to share their experiences and opinions with their dear ones and friends. Offered in various sizes, these custom magnets lend great space for imprinting business visuals, contact details and dates. 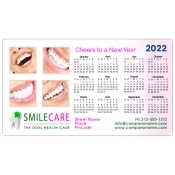 Colorful, promotional calendar magnets add flare and persuasion to any business and dentists offices are no different. 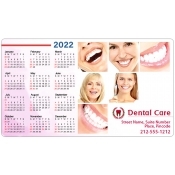 By handing out these logo printed colorful magnetic calendars to regular patients, dental and orthodontist offices can easily build upon their referrals and foster lasting relationships. We offer assistance in designing these customized magnets. You can share your artwork with us at art@cmagnets.com or share it at the end of product upload page. We offer free art set up, free online design proof and free full color printing to all our products. Marketers can easily get their business logo and other details imprinted over these refrigerator magnets in the colors of their choice. To know more about designing and customization of these best-seller promotional dental calendar refrigerator magnets, feel free to approach us at info@CMagnets.com or 855-762-4638 (Toll Free).